Because sometimes I don’t want taquitos, except for the fact that I always want taquitos. 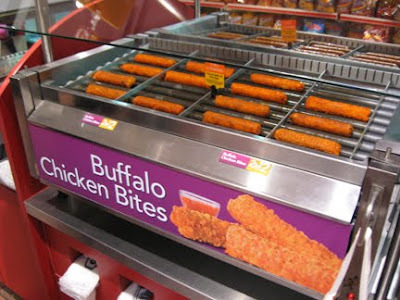 Buffalo Chicken Bites are the latest addition to QuikTrip’s roller grill wonderland, and the first time I saw them a couple of weeks ago, I almost got one for breakfast. However, I was in dire need of coffee, and even though coffee and buffalo wings are two of my most favorite things ever, I’m pretty sure they shouldn’t be enjoyed in tandem. That morning, my caffeine jones won. 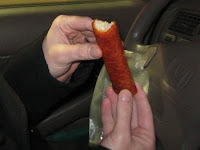 So on our way to see RJD2 at Record Bar last Wednesday, I told Shaw about the Buffalo Chicken Bites. Considering what a connoisseur of QT rolling foods Shaw is, I was surprised he hadn’t heard of them already. Seriously, this is the guy who with his girlfriend brought over a variety box of burritos, taquitos and hot dogs to our New Year’s Day party. Clearly, we were going to need to make a stop at QT. Buffalo Chicken Bites are 2 for $2 or $1.19 each, and I think having the word bite in the name is misleading. While you can take bites of one, the item in and of itself doesn’t constitute a bite per se. Unless you consider a bite to be the size of roughly five cubic inches of buffalo chicken. I wasn’t really sure what to expect. They look like giant reddish-orange mozzarella sticks. Or as if they might house a filling of sauce and diced chicken within a thick and bready deep-fried capsule. Sinking my teeth into my Buffalo Chicken Bite, the barely-there fried coating offered little in the way of crispiness, but did have a medium level of buffalo heat cooked into it. 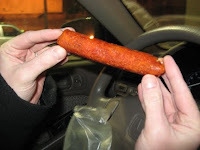 The interior was made up of some sort of chicken log, with the consistency and flavor of packaged luncheon loaf before it’s cut into individual slices. Taking about eight bites to finish, my Buffalo Chicken Bite was remarkably mess-free, save for a little bit of grease on my fingers afterward. And it might just be in my mind, but curiously, I found it to have an aftertaste like that of cheese. Shaw and I both agreed the Buffalo Chicken Bites were neither bad nor by no means great. Actually, they were kind of gross. I don’t think I’d ever choose a Buffalo Chicken Bite over a roller grill burrito -- but then again, there’s no saying what depths I’ll sink to whenever that crave for buffalo sauce kicks in. What do you think the next QT rolling food breakthrough will be? Here’s my prediction: Stickburgers. If asked to express our feelings for this place by using the name of a fictional band, we’d answer Loveburger. Yo La Tengo* was at The Granada the other week, and I was lucky enough to score a couple of free tickets from Lawrence.com. Shaw met up with me for the show, although truth be told, he had ulterior motives for making the drive down from KC on a cold Tuesday night -- a chance to finally eat at The Burger Stand. I haven’t shut up about this place since last summer, and he was ready to see if it lived up to the hype. The Burger Stand opened a year ago, and quite frankly, I could eat here every day. 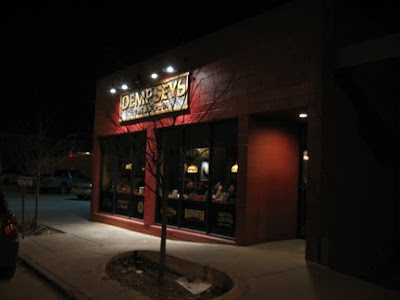 It’s actually located inside Dempsey’s Irish Pub in the former home of Rick’s Place, which moved to 9th & Illinois a while back. You may recall that Rick’s Place was what the gin joint in "Casablanca" was colloquially known as. In college, we played darts here a lot. Never once saw a Nazi. This was the first time I’d been to The Burger Stand for dinner, and it was much more packed than I’ve ever seen it at lunch. Looking at the menu posted over the counter at the bar, Shaw and I decided on The Classic ($6.99), so that he could see just how incredible these burgers are even when relatively unadorned. We also got the pork burger that was one of the day’s specials ($8.99, but I lost my receipt so don’t quote me). We placed our order and got a couple of beers. Dempsey’s has a pretty good selection on tap, including Boulevard’s Tank 7. When drinking in Lawrence, however, I still feel compelled to get the cheapest beer available, and tonight that was Boulevard Wheat on special for $2.50. With beers in hand, we sat down at one of the only three tables open, and waited for our names to be called to come and get our burgers. Considering how busy it was, I was surprised we didn’t have to wait all that long. 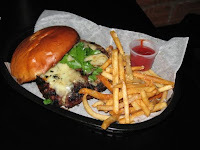 The Classic is basically The Burger Stands’s cheeseburger, topped with Vermont cheddar and locally grown micro-greens. Like most of the burgers on the regular menu, the 1/2 lb. patty is made with a custom blend of tenderloin, strip steak and ribeye, resulting in a phenomenal, melt-in-your-mouth taste that’s unlike anything I’ve experienced elsewhere. The brioche bun makes it even better. The week before, I got a pork burger topped with blackberry mole, blanched almonds and queso fresco. I thought then it must be the toppings that made it so good -- the almonds were super-thin, giving it a bit of a snap to look forward to in each bite. So I was very excited that tonight’s special still had that can’t miss flavor that made the other burger so memorable, yet with toppings different enough that it wasn’t like I was having the same thing twice. Must be the way the pork burger’s patty is seasoned. 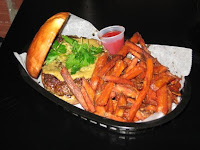 For fries, The Burger Stand has regular ($1 with a burger, $3 for a basket), sweet potato ($2, $4), truffle ($2, $5), duck fat ($3, $6) and chili ($3, $6). Don’t get me wrong, the regular fries and the sweet potato fries are both fine, but to truly complement the flavor of these burgers, an upgrade to the truffle butter is necessary. The duck fat fries were a little on the gamey side for me, and I’ve yet to try the chili fries ($3, $6), which seems like a glaring oversight on my part. Occasionally, the Burger Stand offers poutine -- fries coated with gravy and cheese curds ($4, $7). If poutine is an option, do it. I’m told that in a perfect world The Burger Stand would fix poutine every day, the only problem being they can't find a steady cheese curd supply. Blog Friend Nick suggests Shatto Milk Company and The Burger Stand get to know each other and fast to make poutine a permanent addition to the menu. Lest this sound like a total mash note to The Burger Stand, I’ll mention my disappointment in the Black & Blue ($7.50), a burger that for me was one and done. It sounded awesome, with an intriguing combination of blackening spice, bleu cheese and apple chutney -- too bad there was way too much of the chutney on it, and the tartness totally overpowered everything else. But yeah, besides that, all the other burgers I’ve had here have been outstanding. So congrats to you, Burger Stand. We hereby decree you Lunch Blog’s Favorite Burger, an honor given in both recognition of the excellence of your everyday menu as well as your adventurous specials. If you would like to celebrate by offering us free burgers for life, we will protest slightly in order to appear as if we have some sort of scruples, before we ultimately accept. And now we’re excited to hear The Burger Stand people will soon be opening up Esquina, a taqueria at 8th & Mass where the Round Corner Drug Store used to be. As much as I love burgers, I love tacos even more, and I can’t wait to check that action out. *If you're a Mr. Show fan and you haven't seen the video for Yo La Tengo's "Sugarcube," do yourself a favor and watch it now. UPDATE: The Burger Stand has moved -- now it's in The Casbah on Mass Street.